Eastern sophomore Sydney Sanders dives for a pass, during the Lady Eagles’ straight games win over Miller on Monday in Tuppers Plains, Ohio. Eastern senior Kelsey Casto (10) passes the ball, during the Lady Eagles victory on Monday in Tuppers Plains, Ohio. TUPPERS PLAINS, Ohio — Off and running in October. 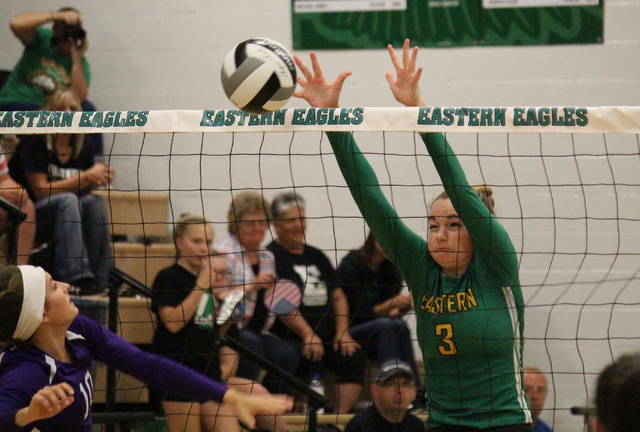 The Eastern volleyball team began the final month of the regular season in grand fashion on Monday at ‘The Nest’, as the Lady Eagles defeated Tri-Valley Conference Hocking Division guest Miller in straight games. Eastern (10-3, 9-2 TVC Hocking) —currently in sole possession of second place in the league standings —took its first lead of the match at 6-5 in the opening game and the hosts led the rest of the way to a 25-16 victory. The Lady Eagles tied the score twice before taking a 4-3 lead in the second game. Miller — which is now 9-4 in the league — tied the it at four, but never regained the advantage. Eastern led by as many as eight in the game, winning it by a 25-17 tally. The hosts scored the first four points of the third game and jolted out to a nine-point, 14-5 lead. Miller fought back to within three points, at 23-20, but Eastern claimed back-to-back markers to take the match-sealing 25-20 win. 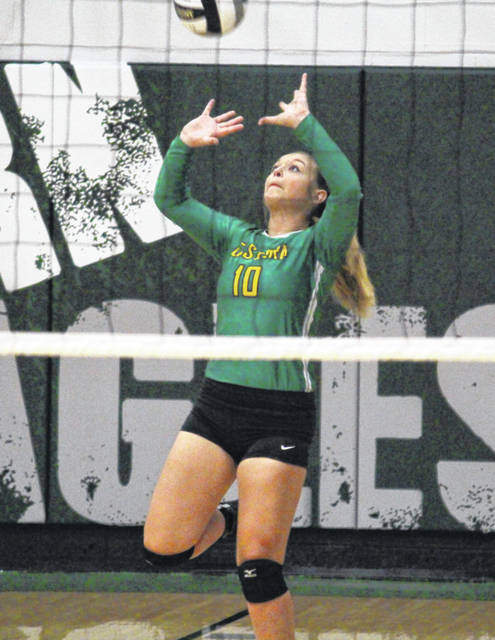 Following the victory, first-year Lady Eagles head coach Mykala Sheppard credited the victory to her team’s ability to keep errors from piling up. Sheppard acknowledged that, along with a better serve percentage, communication is the key to her team taking the next step. For the match, Eastern — which earned 18 aces as a team — missed a total of eight serves for a 89.2 serve percentage. Meanwhile, the Lady Falcons had 16 aces and a serve percentage of 87.3. Eastern had a 54.5 side-out percentage in the win, while Miller’s was 39.2. Eastern senior Alexus Metheney led the hosts with 15 service points, including a match-best seven aces. Kelsey Casto finished with seven points and two aces in the win, while Caterina Miecchi and Allison Barber had six points apiece, with five aces and one ace respectively. Jenna Chadwell contributed five points to the winning cause, while Kylie Gheen and Haley Burton had three points apiece, including two aces by Gheen and one by Burton. Miecchi earned a match-best 14 kills to lead the victors at the net. Allison Barber was next with seven kills, followed by Olivia Barber with five. Layna Catlett had four kills and two blocks for the hosts, Gheen added a pair of kills, while Chadwell had one kill, one block and a team-best 19 assists. 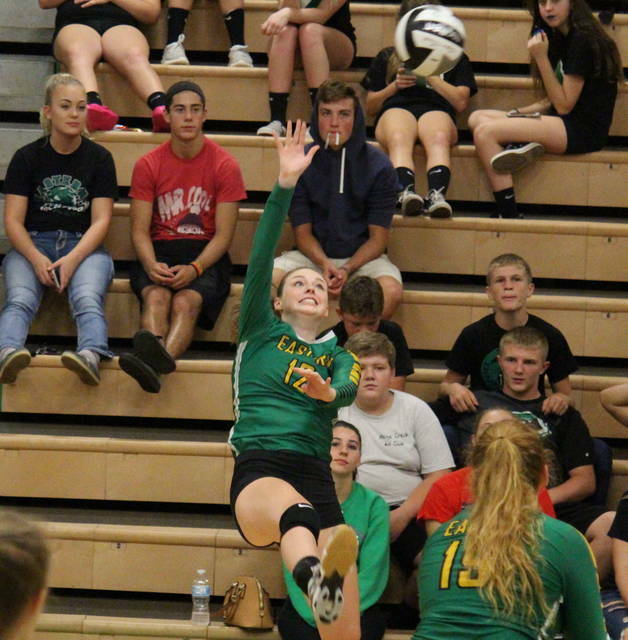 Sydney Sanders led the EHS defense with 11 of the squad’s 46 digs. Josie Crabtree led the guests with eight points, half of which came from aces. Josie Perani had seven points and four aces for Miller, Askya McFann added four points and one ace, while Brooklyn Wilson and Haille Joseph earned three points apiece, with three and two aces respectively. Joseph and Crabtree paced the Lady Falcons at the net with seven kills apiece, with Joseph earning a team-best three blocks. Wilson had four kills for MHS, while Taylor Hinkle chipped in with a trio of kills and a pair of blocks. McFann earned one kill and two blocks, while Perani had one kill, 20 assists and 13 of the team’s 33 digs. 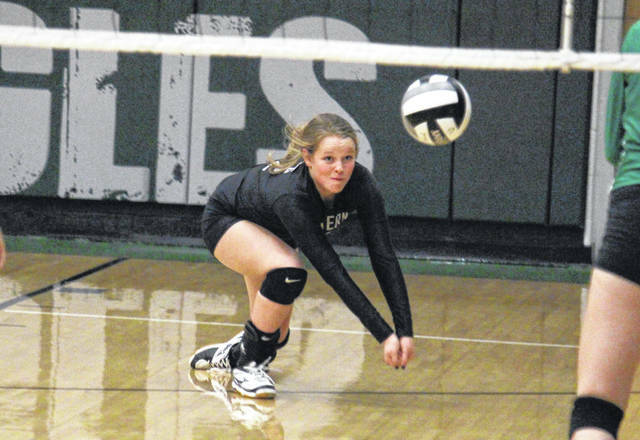 The Lady Eagles are back at home on Wednesday, as they welcome Meigs to start a string of three matches in four days. Eastern — winner of four straight matches — also defeated Miller on Sept. 6 in Hemlock.